Located in Mono County, Old Benton (three miles west of the town of Benton) was a former silver-mining town when Bill Bramlette’s great-grandfather settled there in the 1920s. Established in 1852 during the gold rush, Benton drew most of its profits from silver mining and became a way station for those migrating south. Now it’s a virtual ghost town, with the exception of the bed and breakfast and the antique store that Bramlette and his wife maintain, and the public camping grounds. The remaining eight or so of the original buildings are in varying states of restoration. 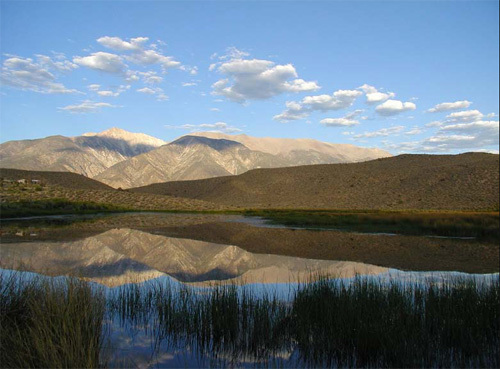 The White Mountains are reflected in the ponds at Benton Hot Springs Valley. Photo by Stephen Ingram. While the mines have long since stopped producing, the real treasure remains: 1,250 acres of open space. In addition to the natural hot springs for which it is named, this “oasis in the high desert,” as Bramlette describes it, is replete with ponds, streams, meadows, and birds (114 species have been spotted there) and other wildlife. Raised on the property by his grandparents, Bramlette developed a strong and lasting bond with the land and its vast natural resources. Like many youth, Bramlette left his childhood home to go to college. When his grandparents passed away and bequeathed the property to him, Bramlette, nearing retirement and having no children himself, faced the tough decision of what to do with it. The property lies just 40 minutes from Mammoth Lakes where the pressures of population growth and the demand for second homes were becoming acute. The easy thing to do would have been to sell the property to one of the many developers who were rapidly descending on the area, but Bramlette said he would rather have died than to have seen the land broken up into small parcels and paved over with vacation homes and malls. He embraced his role as steward of his grandparents’ legacy. 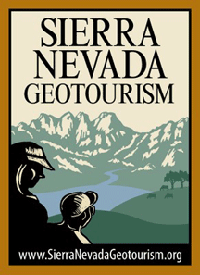 Working with the Eastern Sierra Land Trust (ESLT), Bramlette decided to put 900 acres in a conservation easement, leaving the operating B&B and antique store, the town’s historic buildings, and the camping grounds outside of the easement. In addition, by applying best management practices to minimize grazing impacts on sensitive areas, Bramlette can continue to graze cattle on the land, thus maintaining it as a working landscape. Not only does this arrangement keep the land on the tax rolls, preserving revenue for local schools and services, it protects this beautiful treasure for future generations to enjoy.